What are the differences between the new Nikon 50mm f/1.4G AF-S lens compared to the older 50mm f/1.4D Nikkor? The new 50mm f/1.4G does away with the aperture ring / collar that is on the older f1.4D lens. This makes the newer 50mm lens less suitable for applications such as reversed macro photography where you’ll be able to physically move the aperture ring to the desired value. On the G lens, the aperture is electronically-controlled — you select the aperture by turning the dial on your Nikon camera. This also means that you can’t use a G lens on older Nikon film rangefinder cameras such as the FM2n (review by Thom Hogan). 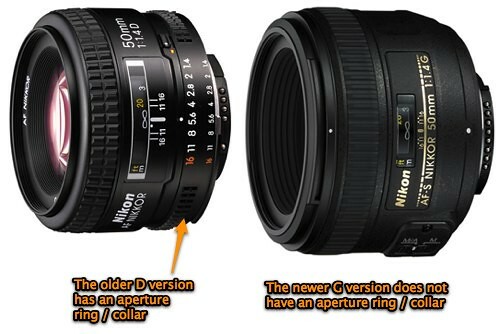 By the way, almost all new Nikon lenses will be of the G type.